"to try again"....in the boys' room. A redesign is what I am talking about! I am so excited about how well it is already looking!! 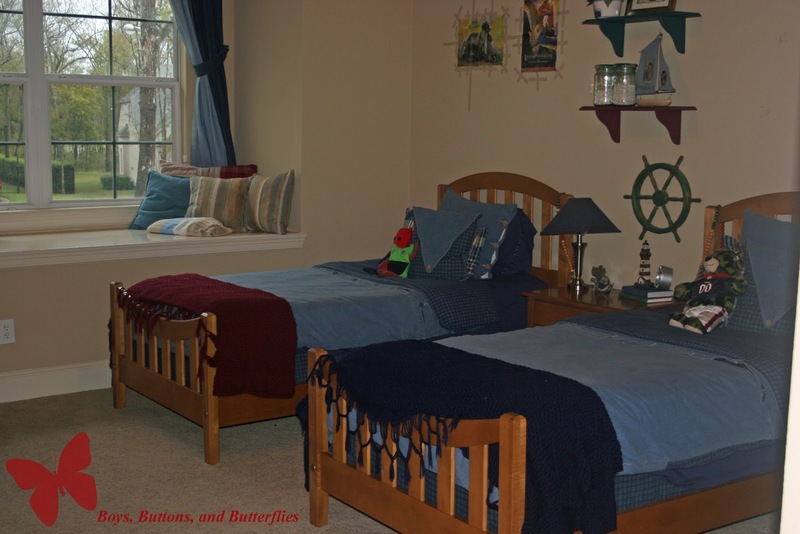 I still am working on their window treatments, making magnets for their magnet boards, and reorganizing their knick-knacks and books! However, laundry had to be finished before going back to work! First off....I must tell you about their "old room". They had their "look" for about 8 years now. The two oldest shared it at our old house. 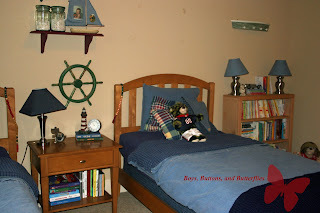 I did make their denim duvets, throw pillows, and did various "crafty" things to make a Ship/Boat theme way back when. However, when the two little ones bunked up together in our new house three years ago, they immediately started campaigning for a new "look". Now that I am looking at the pictures, I have to agree, it was definitely time for a change. Very tired and boring! After starting to pick out fabrics, paints, and accessories in Thanksgiving, we worked on it here and there during the month of December. We didn't really make much progress, until this Christmas Break! 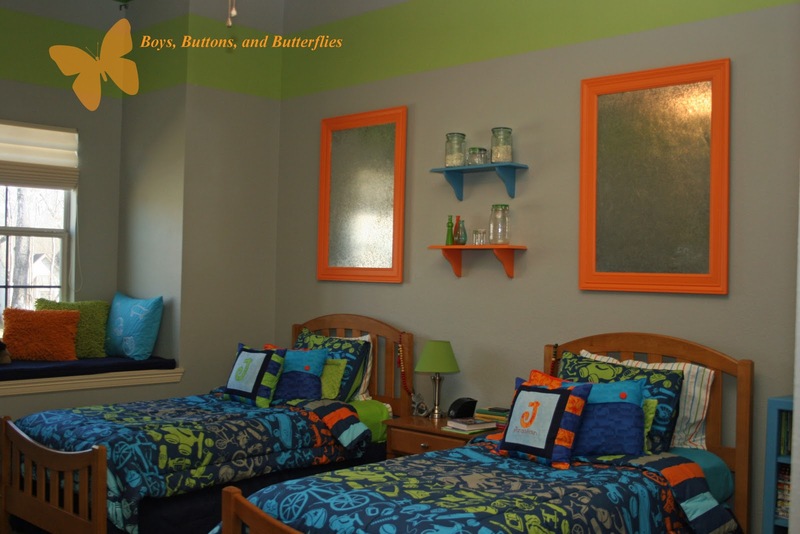 I have to tell you, another reason why I avoided "redoing" their room is that they literally wanted to paint a line down the center and paint their room a variety of colors and have two separate themes. Luckily, early this Fall, I found a comforter set at Target that made me smile. 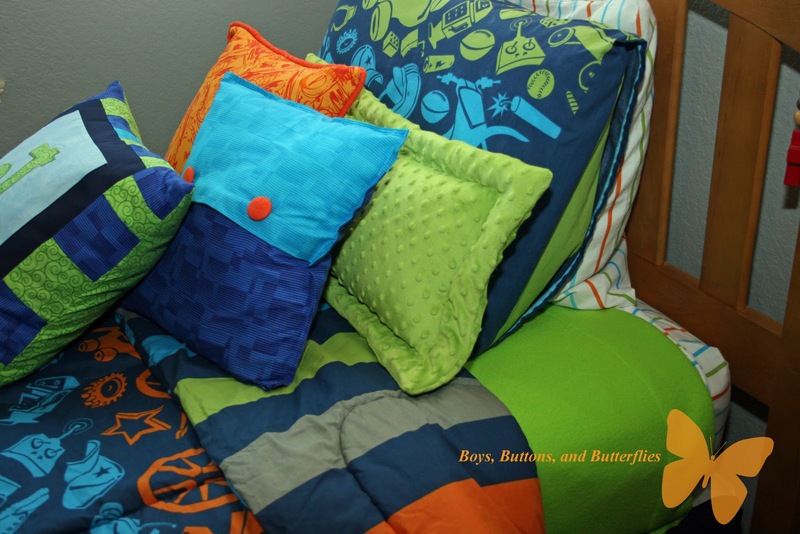 ALL of the colors that they each wanted and there was really no noticeable theme....just boys stuff! So here is our AFTER! 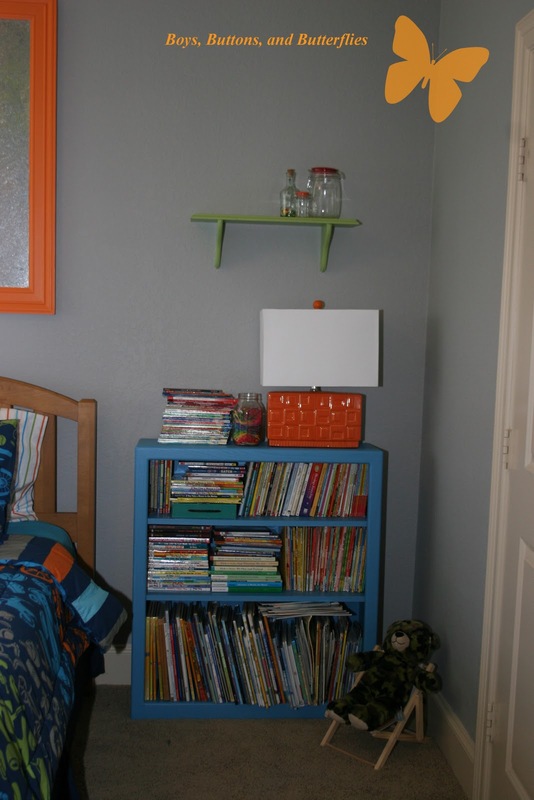 First, hubby painted the room gray (from the comforter). 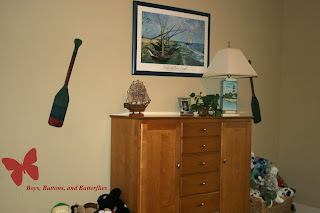 Then we twisted his arm and he painted the green stripe near the top of the room (it is a REALLY tall ceiling). While Hubby was painting, I worked on the boys' bedding first. They chose their respective colored (blue and green) fleece for blankets and helped me shop for ALL of the fabric! It was so much fun and I think they did a fantastic job on their choices!﻿ The green pillow is made of minky, and all the others are from fat or flat quarters! Hubby then built these magnetic boards. Normally, this is something I would do myself, but with my large weight gain in just the frontal area...I am terribly off balance and am very klutzy right now. So no power tools for me right now! We had the metal sheeting from a another project that I never got to, and never will! 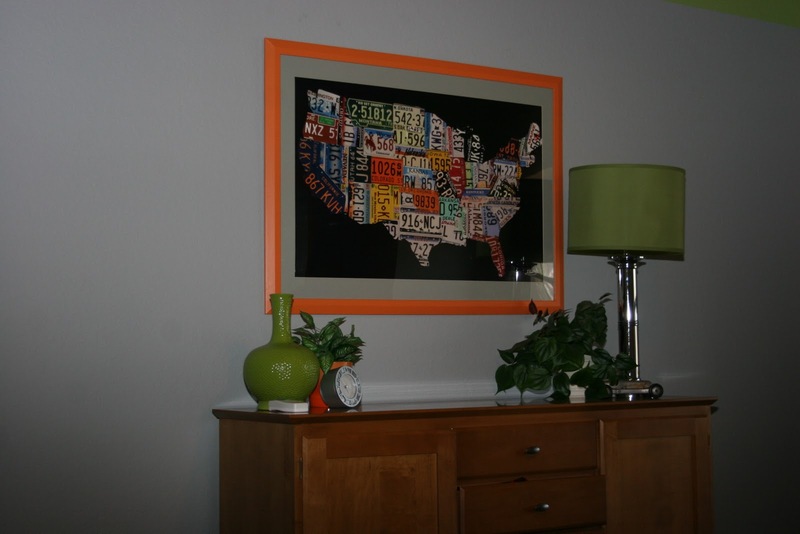 He used door casing and leftover plywood to make the frame. 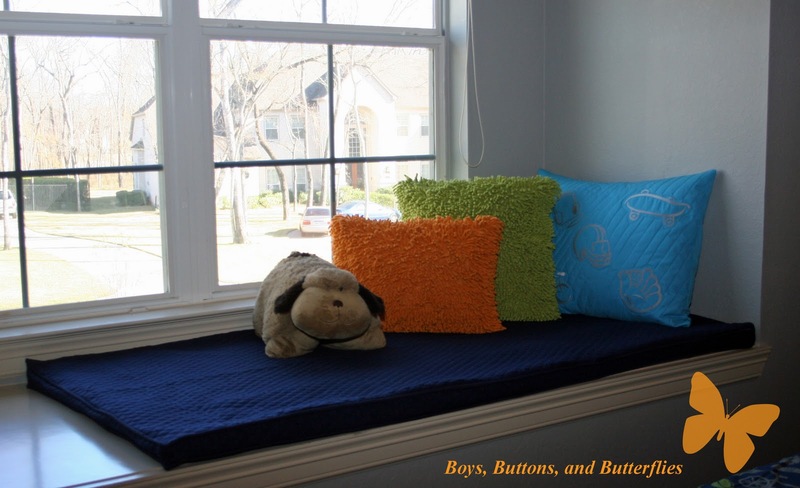 And while he worked on that...I finally made a cushion for the window seat. 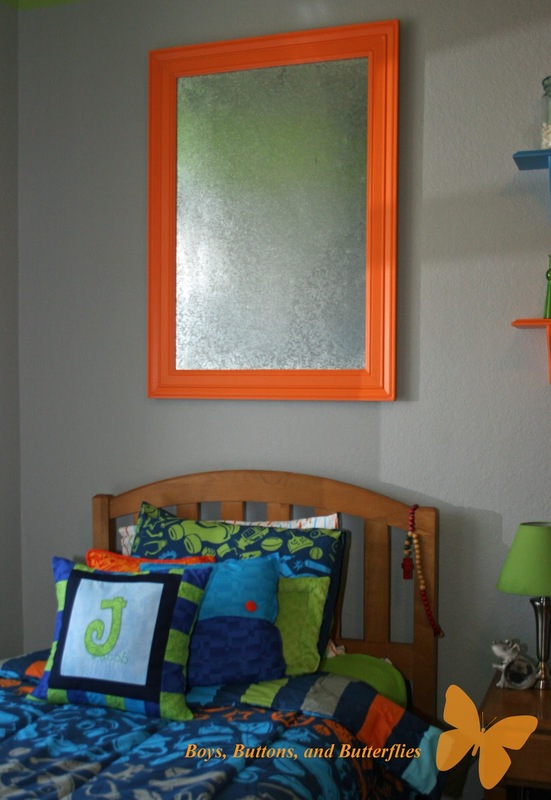 We found the cool orange and green pillows at Home Goods for a really good price. The window cushion is made from a navy pre-quilted material, foam, and some batting. I can honestly say that a ton of piping had to be made and sewn for the edges. I don't mind doing home dec projects, but realize this would not be something I would want to do on a regular basis for others! Here is a quilted pillow case sham I made for the window seat. I embroidered the different symbols (that I found in their comforters). I found clip art images and digitized them. I decided to do "fading" quilting lines so that they were broad starting from the right and getting tighter to the left. I think I still need to work on that technique! This isn't the greatest picture, but I wanted to show off the amateur mat job by me and the paint job by hubby. It is a perfect example of how you can repurpose an old frame you have sitting around..or if you are like me, a closet full of old frames and decorations. I also want to reiterate that all the fabrics, colors, posters, lamps, and knick-knacks were chosen by a 11 and 8 year old. I am so proud of them! 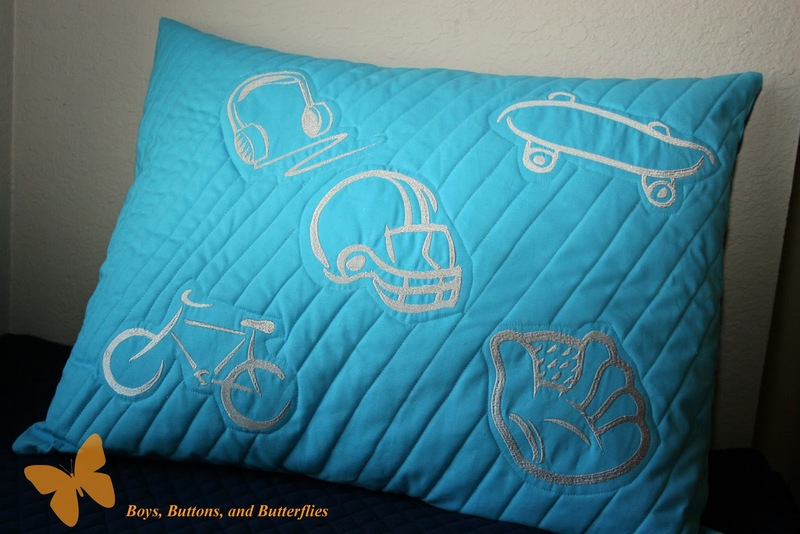 And last but not least, here are their special pillows. They each chose their favorite color and I made a monogrammed/embroidered pillow for them. They were supposed to go on the window seat, but they wanted them on their beds. Just a little individuality when two guys have to share a room! I tried out my new applique fonts that I purchased the other day. 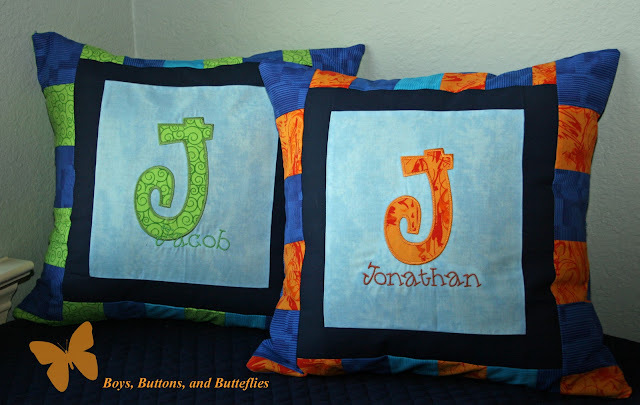 Then I played with layering names...I have decided that I like when the name is separate or if I do overlap, the color of the embroidered name needs to be a very distinct different color! 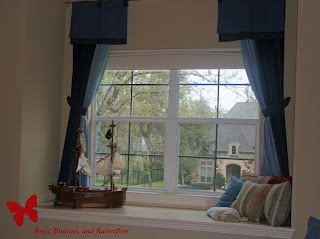 So hopefully, I will get their window treatments done sooner and later....and I promise...their shelves, bookcase will be much more organized!!!! This is AMAZING! You guys did an awesome job! 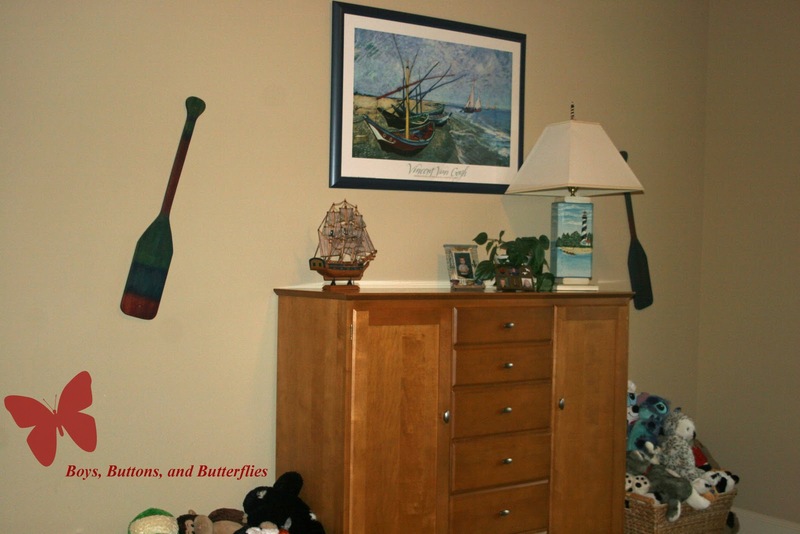 It's hard to make boys rooms fun - and you guys certainly succeded! Thank you!!! I really appreciate it. It IS really hard to decorate for boys!!! Have you ever noticed that a 75 page Pottery Barn Teen has only 10-12 pages dedicated to boys only. Trust me...I've counted!! !